Antero-inferior detachment of the glenoid labrum, commonly (85-97%) associated with first-time traumatic anterior shoulder dislocations. Bankart lesion is often associated with the Hill-Sachs lesion due to their common mechanism of injury. Bankart Lesion may involve the labrum only (“soft Bankart“), or involve the glenoid bone itself (“bony Bankart”). The soft tissue Bankart lesion involves injury to the anterior or anteroinferior glenoid labrum, the fibrocartilagenous structure that surrounds and deepens the bony glenoid. 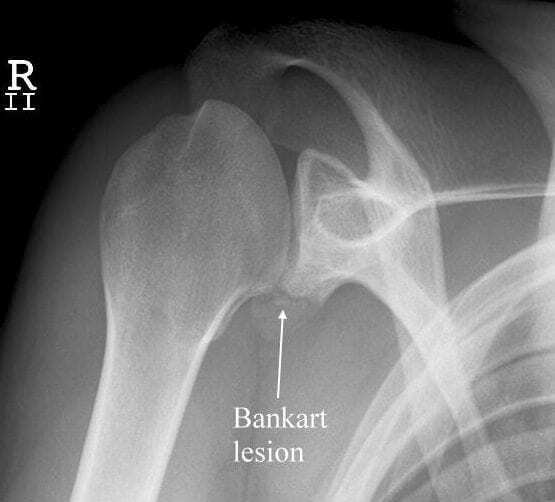 Like the Hill-Sachs lesion, a Bankart lesion may result in anterior shoulder joint instability and recurrent dislocations. Bony Bankart lesion: (a) irregularity of inferior glenoid rim (arrow); (b) double contour of inferior margin of glenoid (arrowheads). 1923 – It is largely due to Bankart’s emphasis that the defect has become widely known [Br Med J 1923; 2: 1132-3]. Perthes G. Über Operationen bei habitueller Schulterluxation. Deutsche Zeitschrift für Chirurgie. 1906;85: 199-227. Bankart ASB. The pathology and treatment of recurrent dislocation of the shoulder. British Journal of Surgery 1938 26: 23-39. Vande Berg B, Omoumi P. Dislocation of the Shoulder Joint – Radiographic Analysis of Osseous Abnormalities. Journal of the Belgian Society of Radiology. 2016;100(1):89.